Jeffrey Tumlin, Principal and Director of Strategy at Nelson/Nygaard Consulting. Photo: Streetsblog. Jeffrey Tumlin, Principal and Director of Strategy at Nelson\Nygaard Consulting, has until early next year to put together a Transportation Department, pretty much from scratch, for the City of Oakland. Tumlin is charged with setting up the department and putting all those goals in motion, as the interim director of the new DOT. Easy, right? Uh, no. From where Streetsblog sits, it seems pretty daunting. If anybody can do it, it’s Tumlin. He’s famous for his work on planning projects all over the world and his uncanny ability to make the wonkiest transportation stuff easily digestible to the general public. That’s important, considering how many voters–and the politicians who represent them–still think better transportation equals widening highways. Tumlin asked Streetsblog for a sit down to talk about what he’s up to. And when a rock-star of the safe-streets movement asks Streetsblog for a lunch meeting outside Oakland City Hall, he gets it. 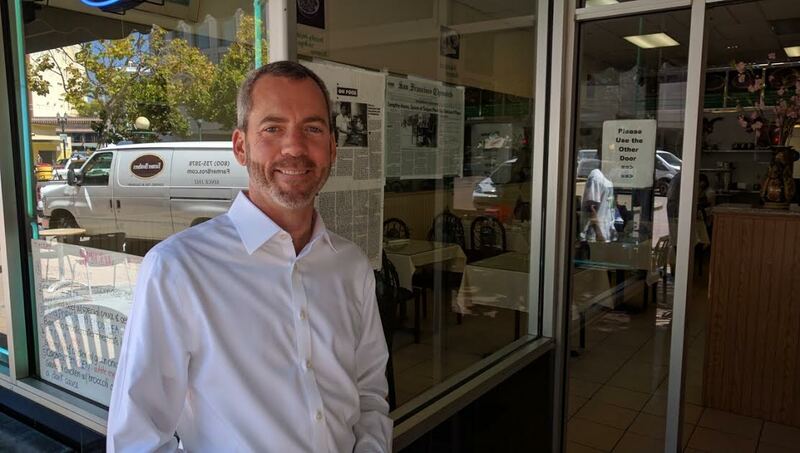 Streetsblog: So Jeff, what brings you to Oakland? Jeffrey Tumlin: My charge is actually fairly simple, first thing I have to do is create a DOT for Oakland. There’s currently one employee, that’s me. We need to create an organization. We need all of the details of the organization chart, including how to split administration functions from Public Works and have the resources to adequately staff our administration functions. Do we organize it functionally or by service delivery? Do we organize the org chart according to conventional silos, or do we turn it 90 degrees and organize it by project team or service delivery. Both structures have profound advantages and disadvantages. JT: Is our primary orientation around skill and function area, or is it around service delivery? In a capital project, you can set it up so one group is in charge of planning, another does design, another does operations, and another builds it. And there’s a hand-off that occurs when it moves from phase to phase. Another way of addressing it is instead of organizing a group of people who do nothing but, for example, budgets, instead organize a project team. SB: So instead of a design department, a planning department, and a bike lane department, you structure it so you have an office for, let’s say, the Telegraph Avenue Complete Streets project, and people from all those specialties are inside that office? JT: Right. So I have designers, budgeters, etc. who are all part of the same group and it’s their job to get something done. SB: Got it. So that avoids that classic problem one always hears about. I think something like this actually happened on Fulton Street in Berkeley and it took a horrible crash to bust through the bureaucracy—the planners wanted to stripe bike lanes, but the public works people kept repaving it without bike lanes because it’s a separate department with a different set of orders. JT: (Nods) The Oakland DOT will be different. 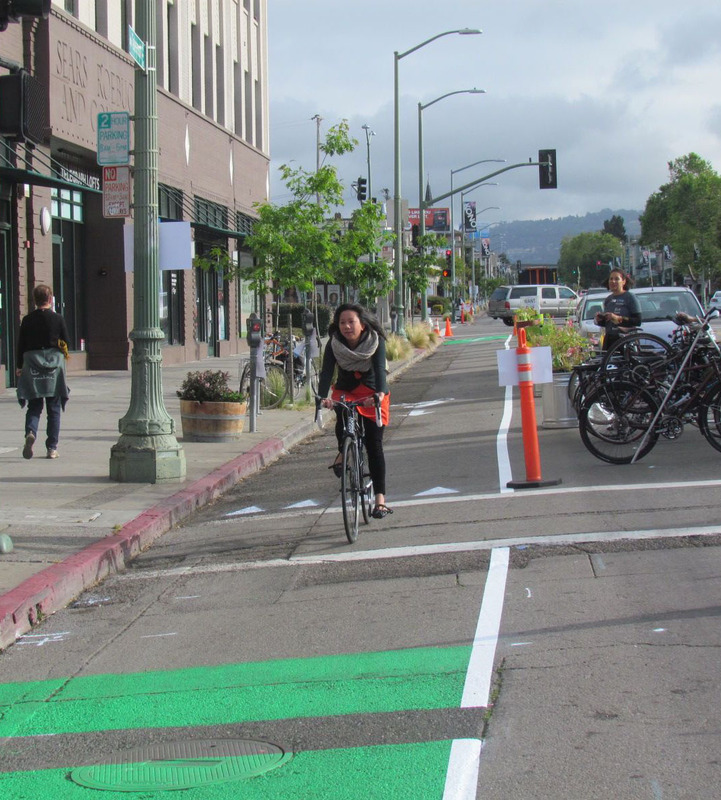 All pavement maintenance will go into the Oakland, DOT, instead of Public Works like in San Francisco or Berkeley. The DOT will be in charge of everything about the streets, with the exception of sewers. JT: Street trees will continue to be run by the Parks Department, which is good because they have tree experts, but there’s a critical hand-off that when we design a street that we think about trees and their maintainability. SB: And you’re busy codifying all this? JT: (nods) We want to make sure that we are anticipating organizational problems and have a solution before they arrive. We want to make sure while we create an organization with a new focus, that we don’t create problems because of separation, that we have a built in process for collaboration. SB: How does San Francisco do it? JT: A combination of the two, like many cities. They form project teams. But I’ve been wondering if there’s a need for a stronger delivery team orientation… anyway, this is all nerdy detail. The other key issue is funding. Our single greatest problem is resource limitation. It drives all of our other challenges. SB: No doubt. How does that translate, day to day? JT: Every day we get well meaning requests from citizens to address stop signs or street lights that are out, or traffic-calming requests. We have about one-tenth of the resources that we need to address all of these requests. So the challenge on a daily basis is how to allocate our very limited resources, both to meet our goal for being a response agency but without contradicting our goal to be proactive to responding to the larger challenges. We could spend all our resources on small requests and we couldn’t respond to all of them and we’d end up ignoring all the structural. SB: And how does that compare to San Francisco? JT: San Francisco is a wealthy city compared to Oakland. Sales and property sales tax is substantially greater. Oakland has a greater area. It has a deferred maintenance problem. We have greater needs and fewer resources. SB: Ever wish you were working for a smaller city? SB: Right, but Oakland has tech companies and it’s getting more. That must help the funding picture, no? JT: A few tech companies have moved here. That’s good news. But a few tech companies are not enough to solve the huge structural deficit that we face with our infrastructure fund. Similarly, our tax revenue comes from both property taxes and sales taxes, so unless people are buying more goods in Oakland, our sales tax is not affected. And unless properties are changing hands–and the assessed value–property taxes are also stagnant. SB: Right. Thanks to Prop. 13, the more stable the neighborhood, the lower the sales tax revenue from it. JT: Prop 13 is an issue, as it is in all California cities. But it’s particularly a problem in old, stable neighborhoods. We love our old neighborhoods, we love the stability, but it impacts our revenue. So funding the new department is very important. Having strong controls over the finances so that we make the best use of every single dollar. I’m finding, actually, that the city has very good productivity data. The city is in fact being remarkably smart and efficient. We compete really well against other cities and even the private sector. SB: Earlier you mentioned the challenges between balancing the overall mission and vision against responding to individual complaints, which you don’t have the resources to do anyway. How does that work out in practice? How, for example, does Oakland deal with something as mundane–but fundamental–as potholes? JT: We know everything about the nature of the problem. Oakland has great data on its pavement conditions. Anyone can Google the pavement index map and see how your own street scores compares to your neighbor’s street and you can see the distribution in the problems. SB: But Oakland has potholes that can swallow a bike wheel. JT: We do not have the resources to address [all of] them. SB: Oakland will have a $600 million bond on the November ballot. JT: The bond goes a very long way towards addressing some of our fundamental problems with our streets and infrastructure. SB: Can you at least pave some bike lanes better? Maybe go around and at least fill pot holes that can cause a cyclist to crash? JT: It’s one of those tricky resource issue about how we spend our money. The presence of vulnerable users is a factor we weigh. I have a big focus on pushing more on outcomes rather than complaints. SB: Like using hard crash data to prioritize fixes, rather than the number of complaints? JT: We are already prioritizing bike corridors, all the ones that are in our bike map. It is possible to just fix the potholes in the bike facility, but doing so decreases our cost efficiency because of the effort in mobilizing crews. If we do some potholes and ignore the ones next to them, it puts a big dent in our overall efficiency number. There’s also a problem with the inequity in who complains. We get fewer complaints in Spanish language or Vietnamese, even though the city has an excellent system for receiving and logging complaints. You can pick up the phone, call them, you can go online or download an app on your phone through SeeClickFix. When you’re out in the field, you have a smart phone upload, SeeClickFix. You can upload the photo, it gets a GPS fix, uploads it all automatically and gets you a ticket number that allows city staff to follow up. SB: But that doesn’t mean it’s going to happen right away. JT: I want to be able to prioritize citizen complaints, so we’re addressing the ones that are serious concerns and not lose the serious concern that children are being killed in International Boulevard because the cars are driving too fast. AC transit is investing in one of the best Bus Rapid Transit projects in the country on International in Oakland. It will be of tremendous benefit. 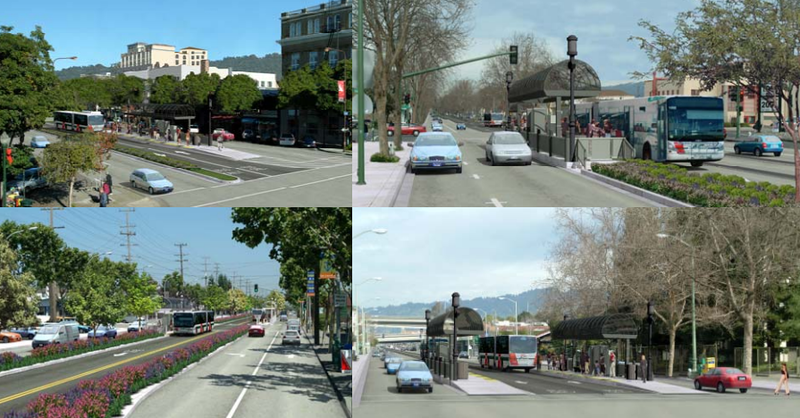 A rendering of Oakland BRT project for International Blvd. Image: the Project Environmental Impact Report. JT: (nods) Dedicated ROW, all the way from San Leandro. SB: No bike lane component? JT: There’s a little stretch where there’s a bike facility to connect some gaps in the neighborhood lane system, but the ROW is really tight. My goal, is to take advantage of this tremendous investment in this and organize other investments around it. I want to make sure that everyone in East Oakland feels safe walking to and from the bus stops. I want to make sure the sidewalk conditions along international are built so new small businesses want to invest there and existing small businesses will thrive. SB: So lots of trees? JT: (Nods) The usual pedestrian amenities: trees, streetlights, trash cans–investments that signal to businesses that it’s part of a great district that is worth investing in. Q: What else you got going on? A: In early October, we will release a strategic plan; Janette Sadik-Khan is heading it up. It’s a document that will be our work plan for the next three years. It is practical document but also ambitious. It’s designed to hold us accountable for actually following through on our commitments and making sure we’re not distracted by what is immediately in front of us. SB: Tell me the executive summary. JT: In keeping with Oakland’s values, we want to look at everything that we do through an equity lens–not with anecdotes and hand wringing but with real numbers. So we have to really define what we mean by social equity and to measure how our investments help or hurt our equity goals. This gets tricky. SB: So you need something like Levels of Service (LOS), but where the “service” might be re-defined as the number of poor people who get access to jobs? JT: The definition is challenging. What do we care about? Am I trying to deliver access to employment? More equitable health benefits to children in neighborhoods with asthma? The city is getting quite serious about particulates and asthma. There are many ways to get serious about equity to define it in a way that is measurable in a way that can be tied to our budgets. We are committed to spending our money to achieve our deeply held local values. SB: But however it ultimately gets defined, it will be better than the old LOS formulas. JT: One thing that’s super clear is when you have an LOS formula that says a person on a 40 passenger bus is valued at one-fortieth of a person driving a car, it does not help us achieve equity. And eliminating bikes and pedestrians is good for LOS but bad for the city. SB: Speaking of that, what about Connect Oakland? I-980 certainly increased automobile LOS, but it split off downtown and created huge inequities. What do you think about repairing that gap in downtown? JT: There’s a measure of net equity impacts. But there’s also the critical issue of opportunity cost. The cost of doing a major 980 project, could potentially exceed investing in the high injury network in East Oakland to where we could eliminate street fatalities. So the big challenge is to what degree does the city focus on moves like 980, or a hundred small moves that eliminate fatalities. To some degree those objective are in tension, but in another way economic development is essential if I’m going to have the resources to achieve equity outcomes. It becomes a task of re-framing economic development into terms of community benefits. How does development allow us to fund other community objectives? That’s what I want our tools to allow us to do. SB: If I’m understanding you right, it’s okay to woo tech and other companies to Oakland, as long as it is ultimately funding safer streets and better communities? JT: Provided there’s actually a revenue mechanism in place. SB: Aye, that’s always the rub. And you’ve got until February or so to get this all in place? JT: It is the most challenging job I’ve ever had. But I love this job. It’s some of the most meaningful work I’ve ever done. I love Oakland. Oakland is relevant. The issues Oakland faces are substantial. And all of the issues facing our industry as a whole–in many ways Oakland optimizes those issues. It’s a remarkable opportunity to make a difference. Great interview thanks! Jeff was being modest as the East Bay BRT project does include some significant bike amenities. The buses themselves will provide on-board bike access and bike parking at most stops, and the striping plans include a bike lane on 11th Street in Downtown Oakland, on E 12th Street completing the gap between Lake Merritt and Fruitvale, and on International Blvd from around 54th Ave out to 84th Ave or so. The bike lanes are pretty standard and unremarkable for the most part, but they do provide a little bit of space for bike riders in parts of town where bikeways are currently few and far between. My experience tells me that most bicycle-swallowing potholes are caused by utility crews. Is this new department also responsible for coordinating excavations by utilities? Oakland recently updated their standards for utility excavation and pavement replacement to help address some of these issues, but without consistent enforcement and significant penalties for non-compliant work the problems will persist. I’ve already brought up to staff the oversight and enforcement component of this, as well as sufficient bicycle and pedestrian mitigation to maintain safe and convenient access around construction zones. With plenty of construction happening and hopefully lots more on the way for the city, these issues will become even more substantial. I don’t know if this fits in with the DOT development process, but it does need to be addressed either way. I always figured the utilities shouldn’t be allowed to do it at all. A city crew or approved contractor should do the paving and the utility should just get the bill. The system we have today rewards the utility for half-assing the pavement. If anyone can take on Oakland transpo, it’s JT! A good way to raise revenue would be to start charging people with blue placards to park. Around my office, over 50% of the cars parked are “disabled.” Most of them have jobs, and many of the cars are much more expensive than I could afford. Why should all these people get free parking all day? At last night’s Oakland bike/pedestrian commission meeting one of the ideas Jeff proposed was to bring more services in-house under the new DOT instead of contracting out, as this would shorten project timelines, reduce complexity, and likely improve the quality of work. Those of us on the commission have been suggesting the same thing for years, so this was very validating. I don’t know exactly how well that would apply to utility work, but the concept has merit. I think disabled placard abuse is something that needs to be addressed on the state level though. A bill to revoke default unlimited free parking for anyone with a disabled placard, with exemptions for people with specific mobility limitations, was proposed this year but died in committee, I believe. Perhaps it will be back again next year with some adjustments. Speaking of this I rode down 11th at Madison earlier this evening and the clowns that are excavating that block have left a ten-inch gap in the trench plates. Definitely a dangerous spot at the moment. SeeClickFix has been down all evening, too, so I don’t even know how to report it. Great interview. One clarification. Oakland worked to get bike facilities into the BRT Project through negotiations with AC Transit including: bike lanes on East 12th – closing a critical gap – bike lanes in downtown, bike lanes on International south of 54th, a signalized bike connection between East12th and International at 54th, as well as bike parking at all stations and racks on the buses. Is a human in a car equal to a human on foot, on bike, or on public transportation?